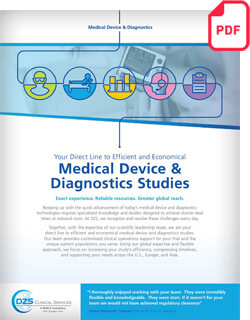 DZS has the resources, experience and global reach to help you seamlessly bring your device or hospital technology to market. We understand the unique challenges of medical device development, and our experienced team can provide customized support for your clinical and regulatory needs. Additionally, we have strategic partnerships with local and global experts in advanced medical technologies and diagnostics for usability, imaging, electronic data capture, reimbursement and health economics. Our capabilities support client needs in the U.S., Europe and Asia. When you need to bring your product to market quickly and within complete compliance, DZS delivers.